Aadhar Card Enrollment Centers in India | How to find Aadhaar Enrolment Center? Many Aadhaar Card Enrollment Centers List in India. 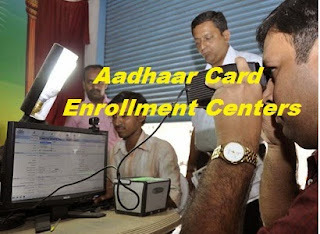 Now here you will get information about Aadhar Card Centers and How to find Aadhar Card Centers. Now newly added Aadhar Enrollment & Update Centers in Banks & Post Offices. We have given the procedure to locate your nearest enrolment center. For new Aadhar card enrollment, we need to go Aadhaar card Enrollment Center. Search your nearest Aadhaar Card Enrollment Center and then go there along with your ID proof and address proof and also book an appointment for Aadhaar card enrollment when you need to go. How to find Aadhaar card Enrollment Center? Now we can easily find Aadhaar Card Enrollment Center by the following Procedure. Enter/Select your selected details and Enter Captcha and Click on Search Button then it displays enrollment center details. You have a chance that is if you want only permanent enrollment centers then select "Only Permanent Centers" option before clicking on search option. Now will display the Bank and Post Offices Enrollment centers. Select Details and click on search you will display the enrollment center details. In tamilnadu No enrollment centres are there..how to solve this.if any chance to get aadhar enrollment centre in my office.